Um Tai-Jung’s oeuvre delves into a world of forms, chromatic possibilities, matter’s expressiveness and textural variations characterising 20th-century art. The piece designed for the gardens of Santo Tirso shows intensely opaque, accurately contoured doors wide open. Made of a highly expressive ferrous material, with a rusty appearance and texture, it conspicuously displays a number of rivet heads. The size of the whole, and especially of each doorframe, makes crossing possible, thus deconstructing the unassailable nature of prison walls. Standing for the end of isolation and oppression, the sturdy wall “cracked open” by the doors becomes a symbol for hope. A passageway, formerly blocked, rekindles the universal longing for freedom. This is the poetic language chosen by Um Tai-Jung, who urges us to think over walls, borders and fortifications, which for political, social or religious reasons are erected as modern symbols for selfishness, conflict, segregation, intolerance and radicalism. 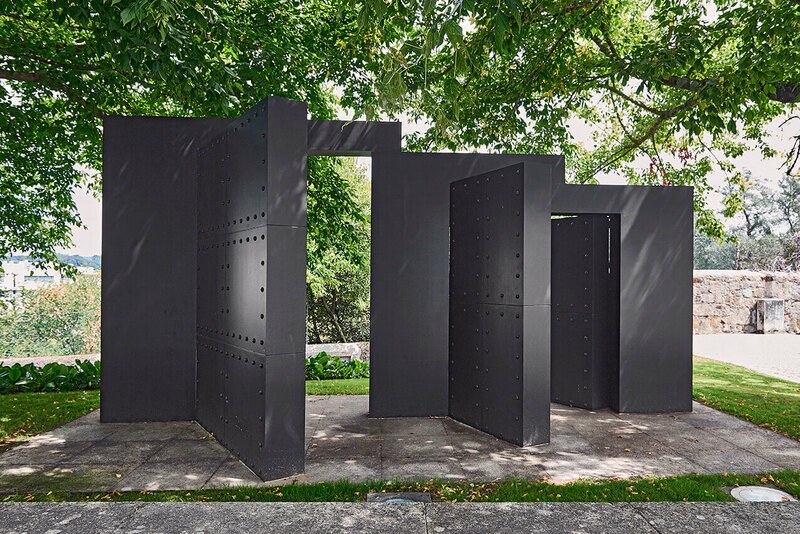 Viewers are encouraged to go through Um Tai-Jung’s doors as a statement of open-mindedness, freedom and utopia.